Anyone who’s ever been camping or stuck in a blackout can describe the feeling of dread when realizing your phone or computer battery is down to 5%. That’s where Kalisaya’s KaliPAK™ comes in. 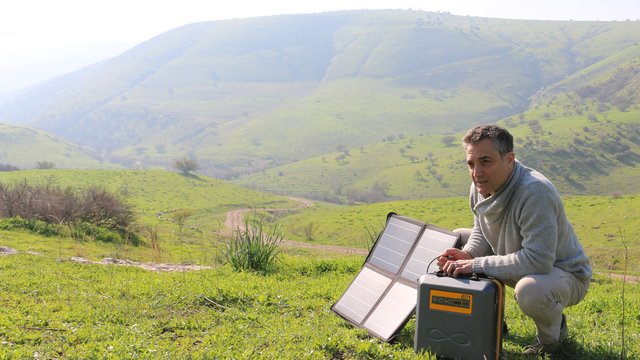 Here, co-founder and design director Yaron Gissin, tells me more about their innovative portable solar energy solution. Shachar Shamir: As the founder and the company’s design director, what made you found Kalisaya and what was the inspiration behind the KaliPAK? Yaron Gissin: It all started with a three-day photography trip to the desert. But, we were forced to cut our trip short after our cameras, smartphones and laptops all ran out of power. We really understood just how important it was for us to have a lasting portable power source on hand and soon began sketching our idea and promoting it. The first demand came from a surprising source: the Israeli Air Force Humanitarian Rescue Mission for Global Disaster Areas. They needed power in disaster areas to set up a field hospital. We recruited some multi-talented people – Industrial designers, electronic and mechanical engineers and disaster-recovery experts – and we built some prototypes. Two of these units served the IAF Rescue Team during the Typhoon Haiyan disaster in the Philippines in 2013. Hurricane Sandy emphasized just how important an autonomous and portable power source that can store significant amount of energy actually is. We understood that the KaliPAK wasn’t just something outdoor people need, but is also extremely important for home emergencies. It would be much more convenient than a small diesel or petrol generator, which most homes don’t have in any event. SS: In simple terms, what does the KaliPAK actually do? YG: The KaliPAK provides electric power when the grid fails or where it doesn’t exist. Its other most significant attribute is not about what it does, but rather what IT IS: A highly portable, lightweight companion for outdoor usage and emergencies. When the KaliPAK’s ample 558 Wh battery is exhausted the user is able to simply recharge it from the sun through Kalisaya’s high-tech solar panels. SS: What is happening in the news right now that makes your company and the KaliPAK relevant? YG: Global warming and extreme conditions are creating frequent natural disasters. According to a recent research, over the past 20 years less deaths occurred from natural disasters, but the amount of people affected from such disasters tripled! The first infrastructure to fail during a natural disaster, be it a hurricane, tsunami, forest fire, or earthquake is the electric grid. The KaliPAK should be in every home for such cases. The ability to take it to outdoor recreational activities is just another added bonus. With global proliferation of mobile devices, the KaliPAK is the ultimate companion that enables the freedom of detaching oneself from the grid. Tesla (Solar City) and other major renewable energy service providers create a significant buzz around grid-independency. However, KaliPAK takes this a step further by allowing grid-independency not only at home, but everywhere. SS: How are the solutions Kalisaya offers different than other businesses that deal with solar energy cultivation? YG: Energy harvesting is mainstream. However, making energy harvesting portable, and in an efficient manner, is the cutting edge of modern energy consumption. There are very few competitors that sell portable, renewable energy products that actually deliver on their promise and sell in major outlets, such as HomeDepot and Walmart. The major differences between the KaliPAK and other products are the energy-to-weight ratio. We provide the lightest per-watt solution as well as a smart app that monitors and helps users manage their off-grid energy, and helps users get the most out of solar charging. We also offer a unique patent-pending solar fixture that enables the highest efficiency level with any solar technology. SS: In which ways has your previous experience as both an entrepreneur and designer helped you improve Kalisaya? YG: It seems to me that the common attributes shared by a designer and an entrepreneur are what drove me to think out of the box, never stop dreaming, and to have an urge to fulfill my dreams. In addition, by implementing creative methodologies into our business processes, we were able to resolve issues with our product like no one did before us, while still being economically viable. SS: What have been the biggest obstacles facing Kalisaya so far? YG: Being a rather new industry, portable renewable energy still requires us to educate the market. There are many false advertisements and false promises created different vendors. Another major obstacle was that poor handling of Lithium Ion by non-professionals created some hazardous incidents in the past, which in return created some havoc around the regulation of shipping LIthium Ion batteries. This is something we’ve worked very hard on resolving to ensure the safe and prompt delivery of all of our products. SS: One last question: What are your goals for Kalisaya? Where would you like to see the company in the future? YG: Kalisaya, in a loose translation from the old Inca language of Ayamar, seems to be a term that describes the energy that arrives from the sun, seen in the lightning and is perceived in the halo of a person. We at Kalisaya aim to change the way people use energy. Our goal is to turn energy consumers into smart, environmentally-aware energy users. We believe that environmental, social impact and financial return are in a symbiotic relationship when it comes to emergency preparedness, as well as to motivate people, and mainly millennials, to spend more time outdoor. The initial product of the company, the KaliPAK, is a first in a series of evolving technologies around efficient, usage-driven, and portable renewable energy products. Our next generation products, currently under development involve cutting edge technologies, hidden behind simple and smart interfaces, to provide virtually infinite energy on the go.